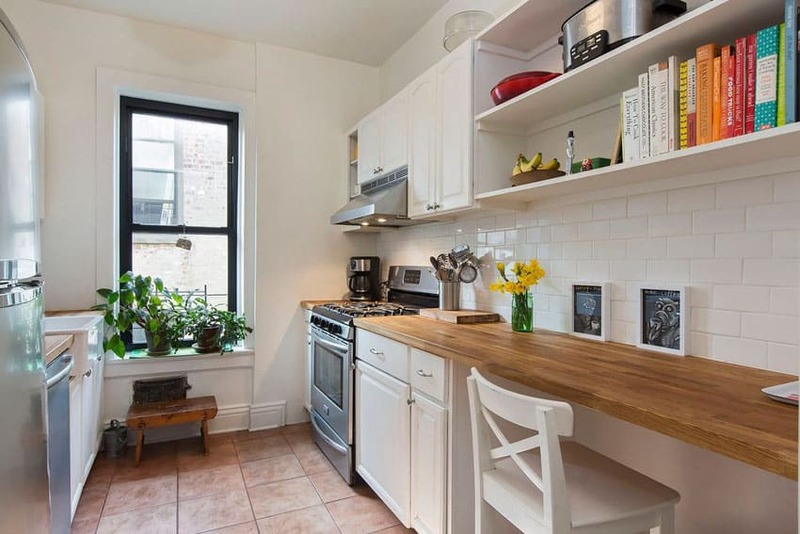 Welcome to our gallery of small galley kitchens. 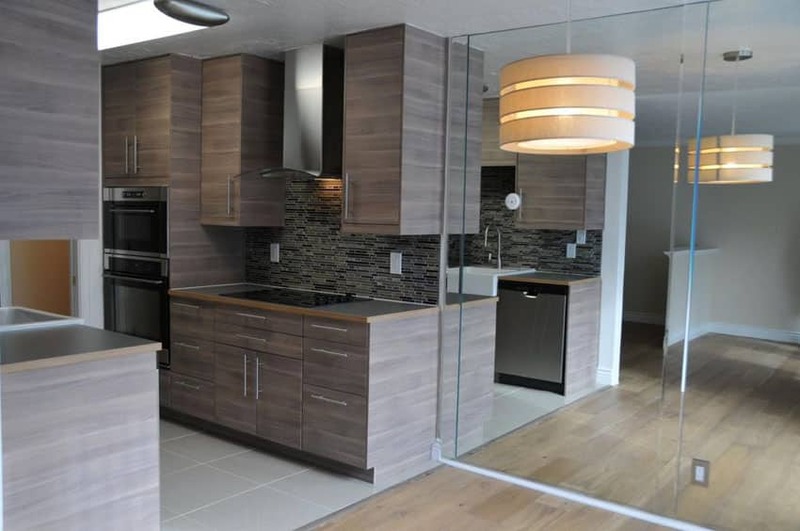 Small gallery kitchen layouts are popular in many apartments, condos and small or older home designs. 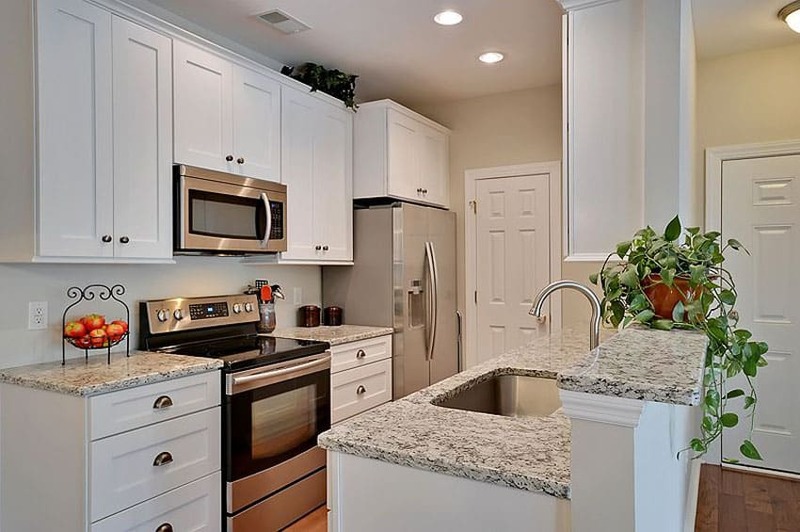 Below you’ll find create galley kitchen ideas for placement of cabinets, lighting, and appliances to make the most out of a compact kitchen space. 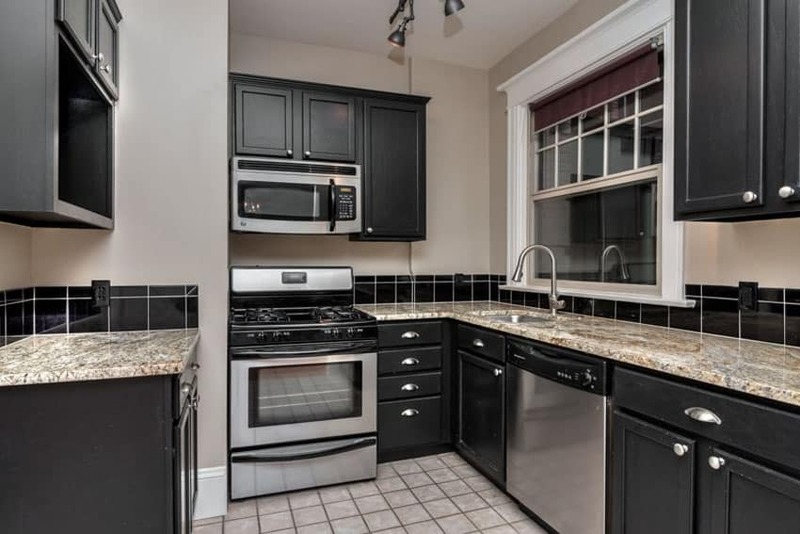 The picture above features a beautiful galley kitchen with cool gray cabinets with matte black metal handles. Warm oak floors in engineered wood nicely accent the cabinetry, the white farmhouse wash basin and off-white quartz countertop. The mullioned window in beige frames the beautiful outdoor scene and brings it into the traditional style kitchen. Maximizing the space of a small galley kitchen can be a challenge. To help your space feel and look bigger there are several classic interior design ideas you can use. Use light color cabinets – White cabinets are more light reflective and can help give the appearance of a larger space. 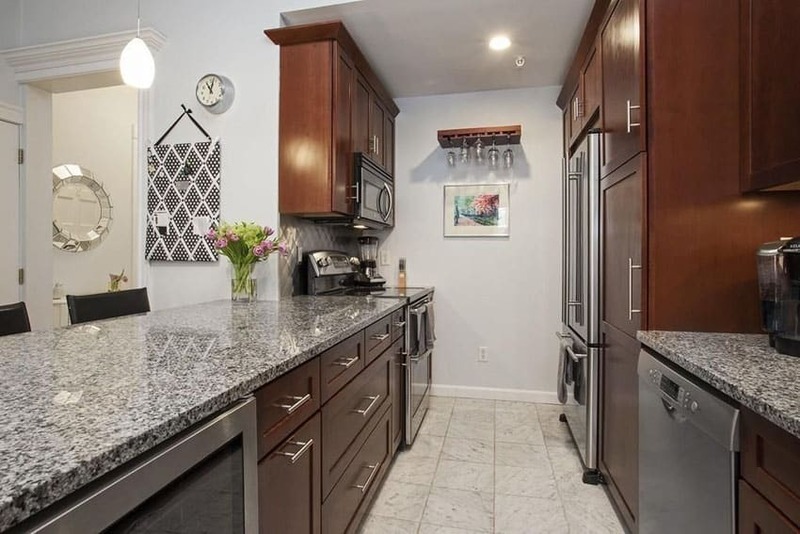 Choose a low contrast color theme – Kitchen designs with little variation in the color of the cabinets, walls, counters and flooring can be cohesive and help a small space look larger. Select different colors that are side by side on the color wheel and provide complimentary shades. High gloss cabinets – High gloss cabinetry offers a clean look that also reflects light to keep things light and bright. Use reflective backsplash – Mirrored or reflective style kitchen backsplash can help reflect natural light and give the feeling of a larger space. Open shelving – Using open shelving without doors or glass faced doors can offer depth perception and give the appearance of more room. Use larger mosaic tile backsplash – Small design or complicated mosaic tile can make the design look too busy. Try using a basic design backsplash tile to help a kitchen feel bigger. Maintain clutter-free counters – A popular counter space saving measure is to have your microwave built-in to your cabinetry. Another idea is to remove all small appliances from the counter area and store them in a garage or pantry until they are needed. Get as much natural light as possible – Installing a skylight or maximizing the amount of natural light coming in to the kitchen can drastically improve the feel of a small space. You’ll also want to put in plenty of ambient and task lighting to ensure your kitchen has adequate lighting for any time of day or night. 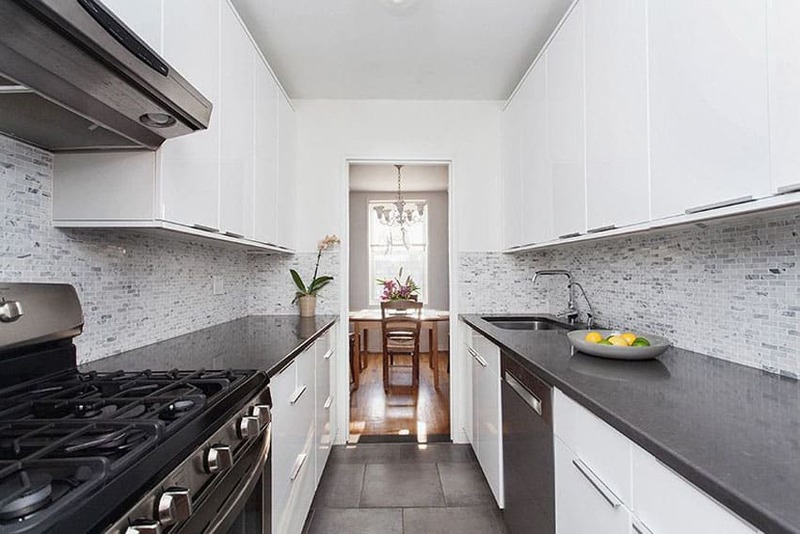 This tight galley kitchen is made wider thanks to the linear illusion created by the cool grey-green subway tiles along its backsplash and light grey walls. The crystal chandelier at its center illuminates the grey travertine tiles in a coursed ashlar layout and the Juparana Delicatus granite countertops. Plain white cabinets and a door frame leading to the trendy living room complete the retro modern look of this kitchen. Solid black Corian countertops are a great accent to the white walls, plain cabinets, and trims of this galley-style kitchen. Dark grey tile flooring provide a rustic accent while the mosaic marble tiles on the backsplash go with the monochrome theme of the space. Stainless steel appliances and chrome-finished faucets and handles complete this modern kitchen. 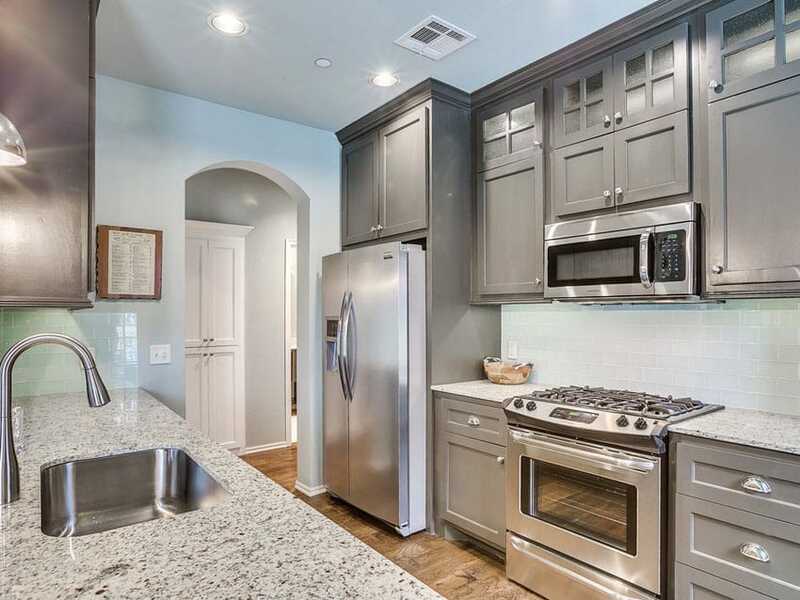 This transitional style kitchen features cool light grey walls with a darker shade of grey for the cabinets. Paired with chrome-finished handles, lighter accents are also found in its powder blue subway tile backsplash and Andino white granite countertops. A warmer, huskier tone was used for the wood flooring in order to contrast with the cool shades. Small galley kitchens can contrast using darker cabinetry by utilizing plenty of lighting, light color countertops, backsplash and flooring. 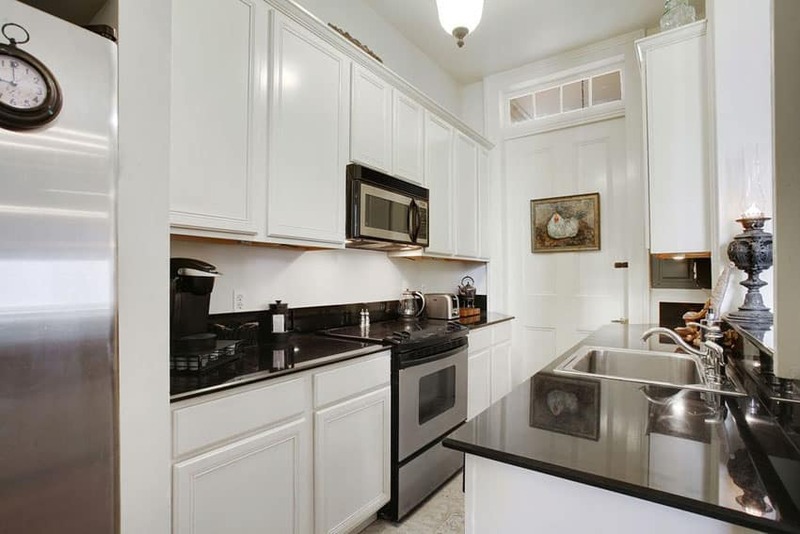 This traditional galley style kitchen is open on one side, serving as a small breakfast nook with black upholstered chairs. The salt and pepper colored granite is a great accent to the rich wooden cabinetry and its chrome-finished handles. Square granite tiles for the flooring add a light accent, as do the light grey walls. Retro accents such as the cork board, painting and wall clock complete this contemporary rendition of a traditional kitchen. 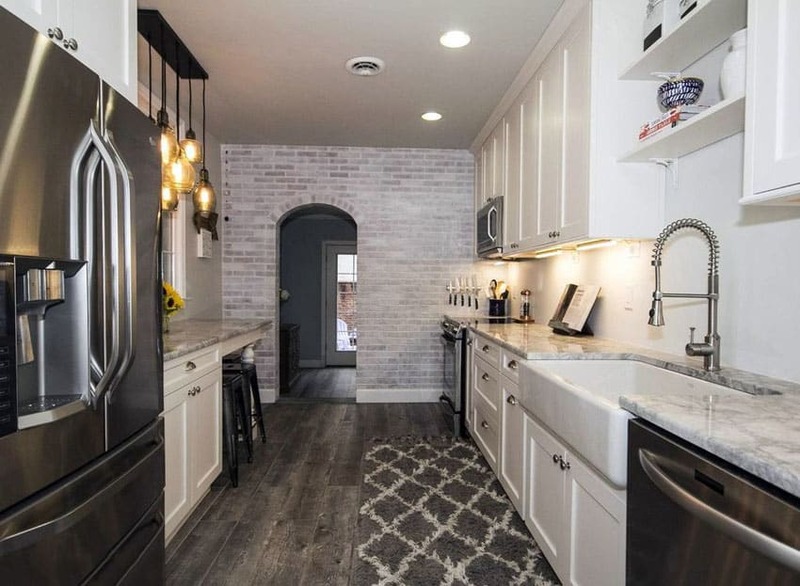 This galley kitchen is given a farmhouse touch with its hanging bell jar Edison lamps and coursed bleached brick wall with arched entryway. The dark wood plank flooring and diamond-patterned area rug also add to the rustic feel while the white shaker cabinets and shelves on either side of the galley kitchen modernize the space. The modern farmhouse look is completed by the farmhouse basin sink and Arabescus white marble countertops. 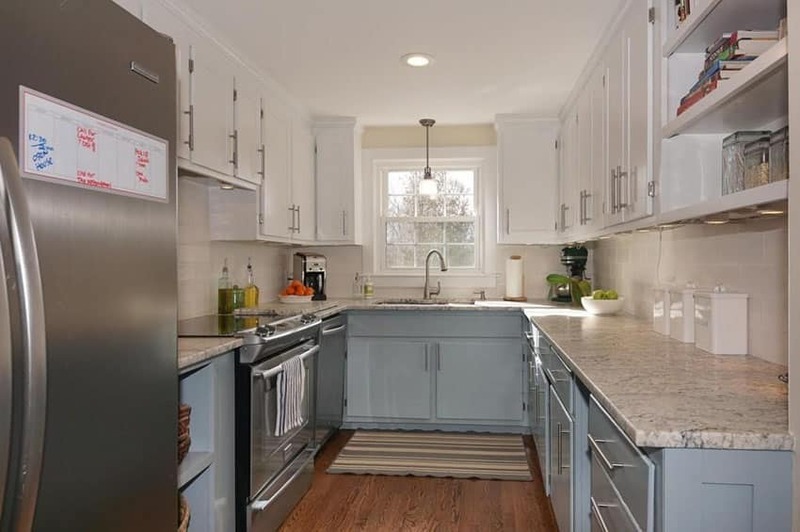 The red oak strip flooring is this galley kitchen’s brightest accent, with its cabinets and caseworks in paneled white wood and silver handles. Giallo Verona granite countertops, stainless steel appliances flushed into the casework, and the white tiled backsplash are a great monochromatic background to the richness of the flooring. Chrome and glass-finished pendant and track lights illuminate the traditional style kitchen along with the double hung window at its center end. 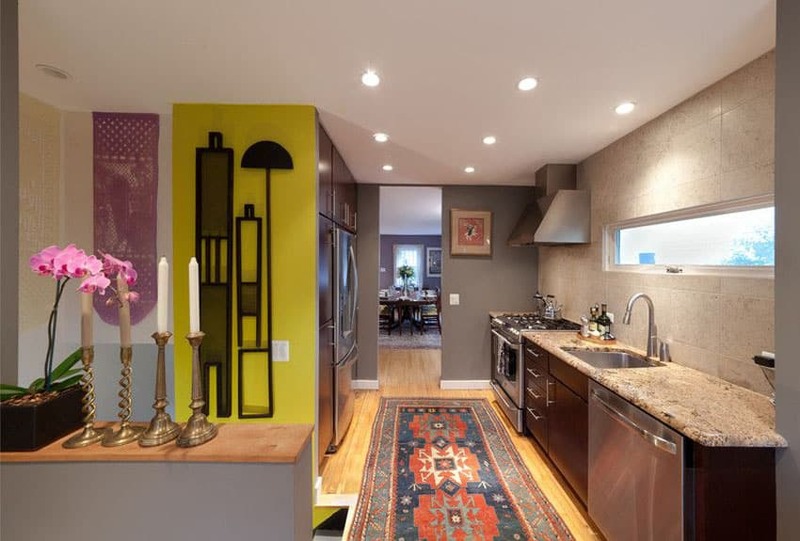 With a mix of eclectic elements in this kitchen, such as the yellow accent wall with embossed illustrations and the patterned throw rug running along its center, the other finishes needed to be a bit more subtle. A reclaimed wood platform on a grey foundation serves as the entrance to the galley kitchen whose back wall, decked in limestone faces a wall of recessed wooden cabinets and stainless steel refrigerator. The back wall is in grey, complementing the varied finishes in this kitchen, including the pink granite countertop. Cool tones of grey are used in this modern-style galley kitchen, starting with the pale grained engineered wood flooring. Moving upwards, the minimalist paneled drawers feature a chrome-finished bar, and the speckled Tundra Gray marble counters create an interesting dynamic with the blue glass mosaic tile backsplash. A shuttered window centered towards the end of the galley bring in natural light and provide a classic accent to the modernity of the kitchen. The rich grains and texture of Red Astoria granite countertops are matched by the deep reddish wooden cabinets with chrome-finished handles. The stainless steel farmhouse style wash basin looks modern but the beige mosaic tile backsplash paired with the diamond-layout orange ceramic tiles on the floor gives this galley kitchen a rustic vibe. This tight modern galley kitchen is given the illusion of more space via its handle-less glossy raise panel white cabinets. As a contrast to the white cabinets and door frame, the countertops are decked with solid black countertops. Traditional-style elements such as the hanging pendant lamp, decorative gas lamp, wall clock and door painting give this galley kitchen a more homey feel. This traditional-style kitchen features chamfered white quartz countertops atop grainy brown wooden cabinets with chrome-finished handles. 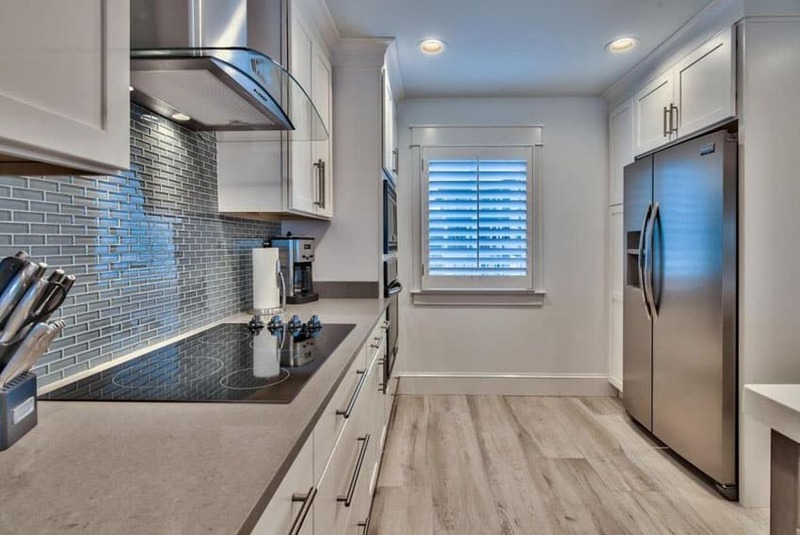 The wood finish is complemented with a lighter, but grainier wood for the flooring, while the white walls and frosted glass hanging cabinets gives this galley kitchen lighter elements. 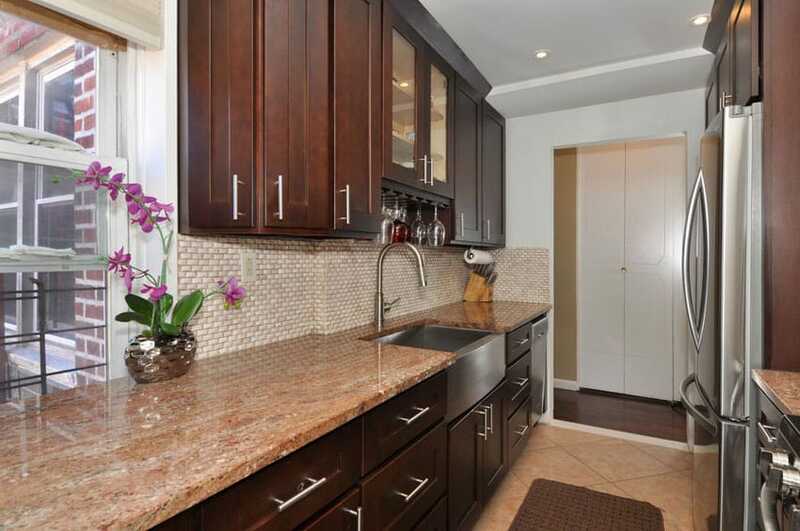 The grain used for the backsplash tiles also echo the wood grain finish of the cabinets and floors. 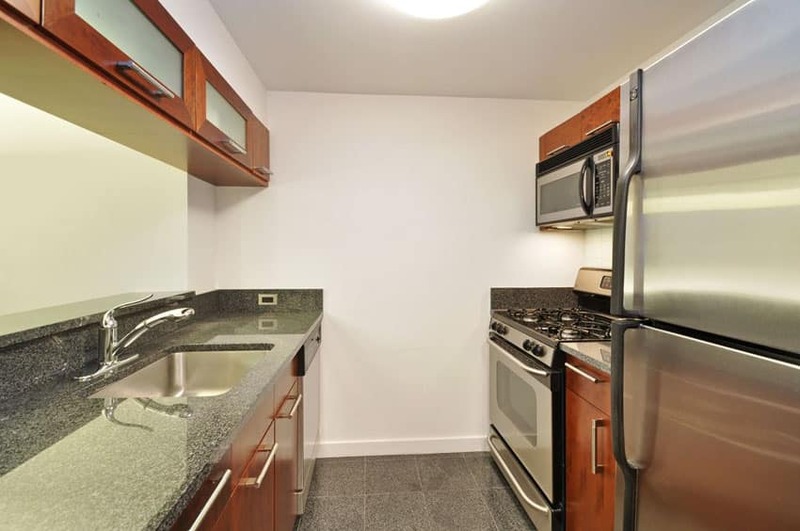 Apartment buildings are well know for having small galley kitchens. Ribbon-grained European wood cabinets and frosted glass panels give this galley-style kitchen a light modern vibe, while the dark quartz countertops and ash grey ceramic floor tiles provide traditional touches. Stainless steel wash basin and appliances flushed cleanly into the casework provide space and clean lines to this modern kitchen. 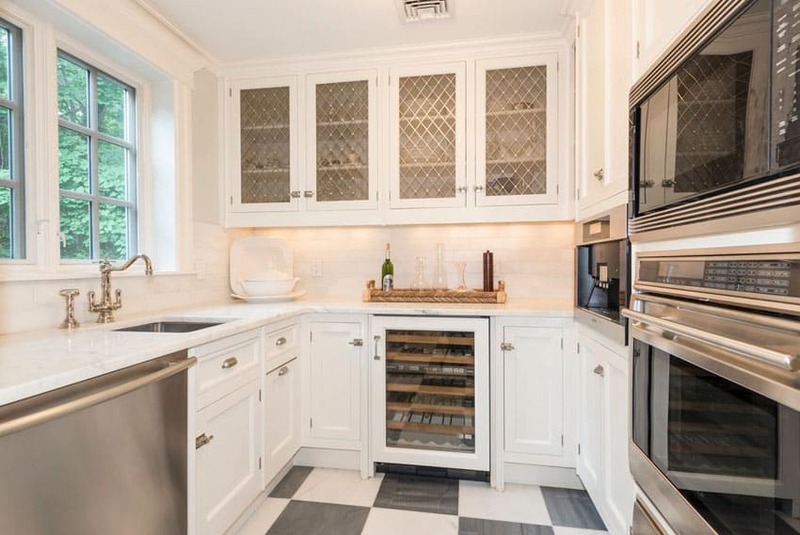 The modernity of the large glass door refrigerator is echoed by this galley-style kitchen in its white, chrome and stainless steel finishings. The double-layer kitchen island in white quartz countertops is supported by plain white casework and plinth and serves two levels of utility – wash basin and prep area, and raised breakfast bar. 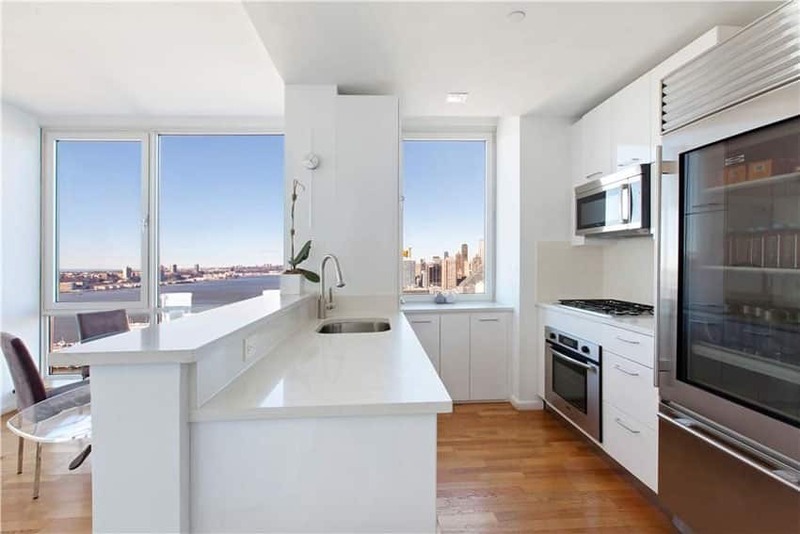 Large picture windows facing the skyline and brings in light to this modern style kitchen, which is emphasized by the drop ceiling specifically over the area. The cottage style of this galley kitchen is embodied by its main highlight, the light blue undercounter cabinets. Chrome finished handles are used and continue on to the white paneled hanging cabinets. Red oak floors with its rich wood finish contrasts well with the blue cabinets and the Bianco Romano granite countertops. 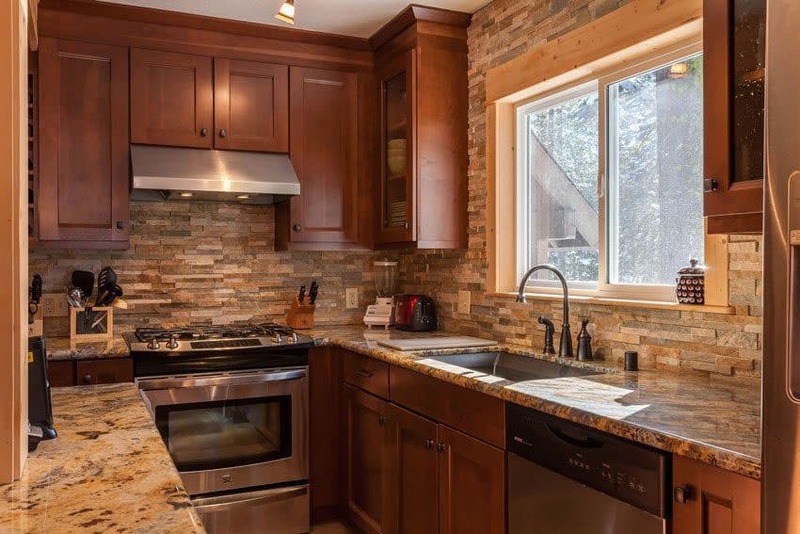 The white tiled backsplash and stainless steel appliances provide a modern cottage style touch, as does the solitary hanging lamp over the wash basin facing the double hung mullioned window. Modern white paneled cabinets and a double layer of shelves go well with white walls, trims and white subway tile backsplash. Depth is added into this retro modern kitchen through its reclaimed wood countertop and pale orange ceramic tiles. The double-hung window in black framing and stainless steel appliances add an almost industrial chic to this small country style galley kitchen. This small galley kitchen is in the craftsman style with its polished wooden paneled cabinets and beige granite countertops. The stacked stone on its backasplash further emphasizes the woodsy feel, as do the oiled bronze faucet fixtures. The modernistic vibe comes from the stainless steel stove top and range hood, as well as the large sliding window over the stainless steel sink. Beige walls and white paneled cabinets are traditional to galley style kitchens, as light colors give the illusion of more space. The small galley setup also took advantage of its peninsula to have it serve as a double-layer for both wash basin and display shelf to the dining room. The light speckled granite countertops go well with the warm wood plank flooring of this traditional kitchen. This Southern gothic galley kitchen features deep black paneled cabinets and shelves with chrome-finished handles. Adding to the dark shades is its black square tiled backsplash and cool stainless steel and black appliances. Lighter accents exist foremost in the white framing of the large picture window, and in smaller amounts in this kitchen’s Avalon white granite countertops and white ceramic tile flooring. This monochrome retro style kitchen is accented by the linear blue and beige patterned throw rug running along its center aisle. The dark wood flooring contrasts well with the white subway tile backsplash and white marble countertops. 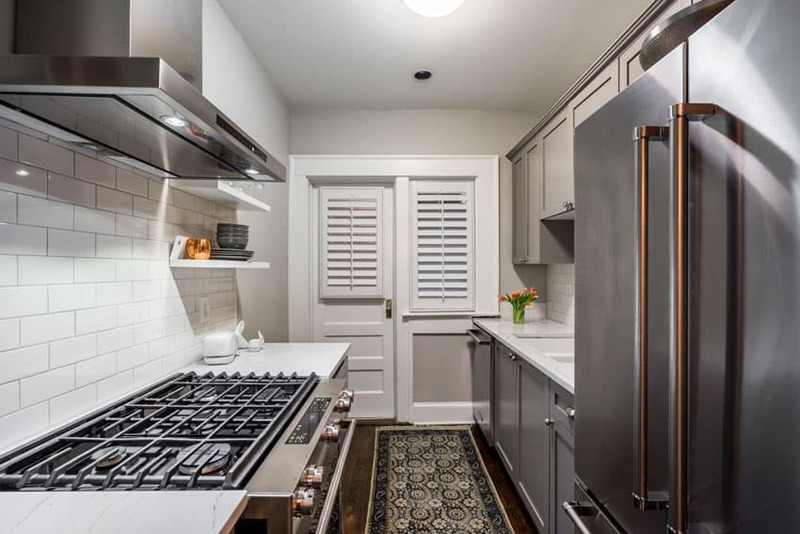 The modernity of the stainless steel appliances complements the homey vibe of the shuttered door and window at the end of the galley. 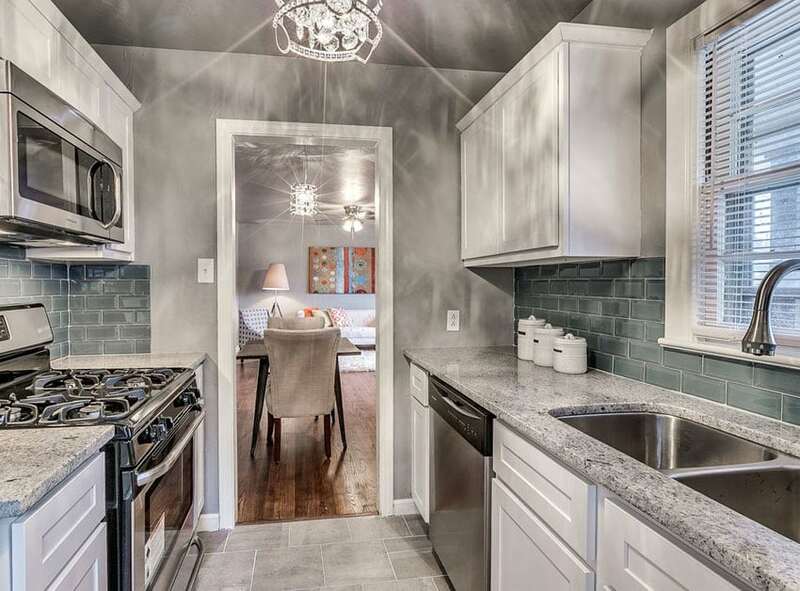 This country style galley kitchen starts out with a checkerboard pattern ceramic tile flooring. 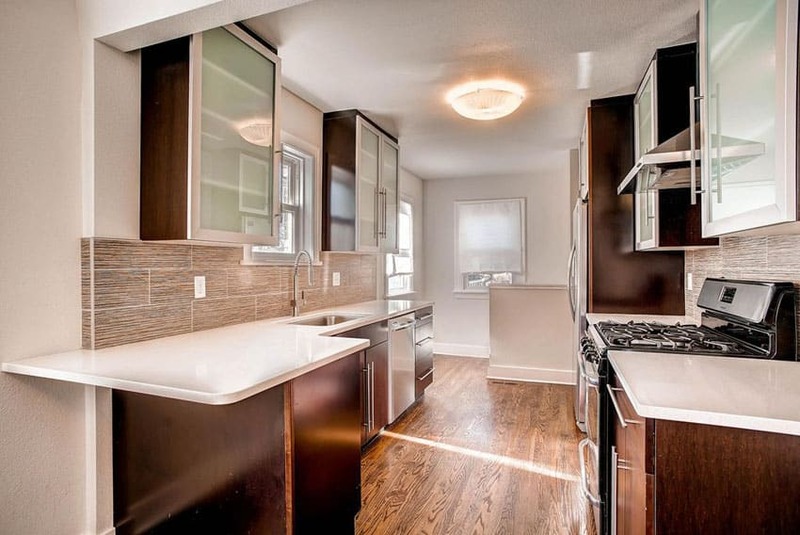 Lighter elements come on top of it with white paneled cabinets, stainless steel appliances and chrome finished hardware. The cabinets are topped by a rich Carrara marble countertop and white subway tile backsplash while the hanging cabinets provide a rustic feel with their cross-hatched extruded metal and glass face. The dark, cool tones of the wood laminate cabinetry is complemented by its slender chrome-finished handles and the lighter wooden plank flooring used for the floors adjacent to the galley style kitchen. Modern elements also exist in grey porcelain tile floors, black and grey strip tile backsplash and grey countertops. The galley hallway culminates in a volumetric cylindrical hanging pendant lamp. 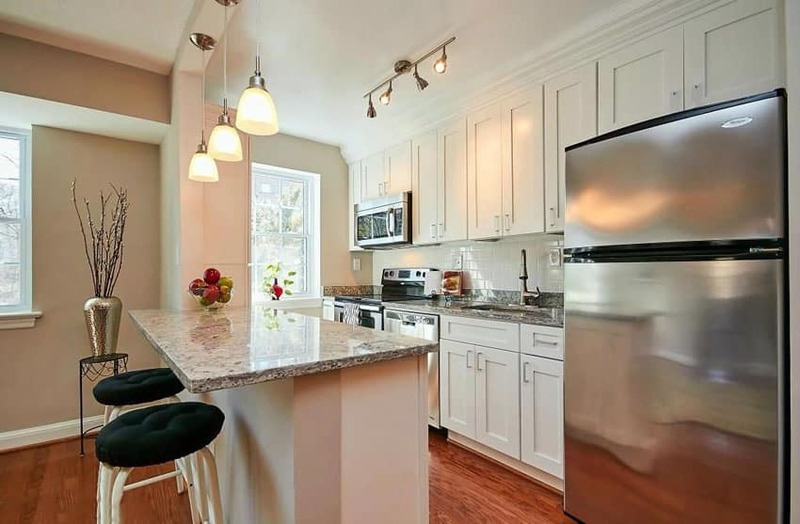 White cabinetry is frequently used in small galley kitchens because it reflects light and brightens a compact space. 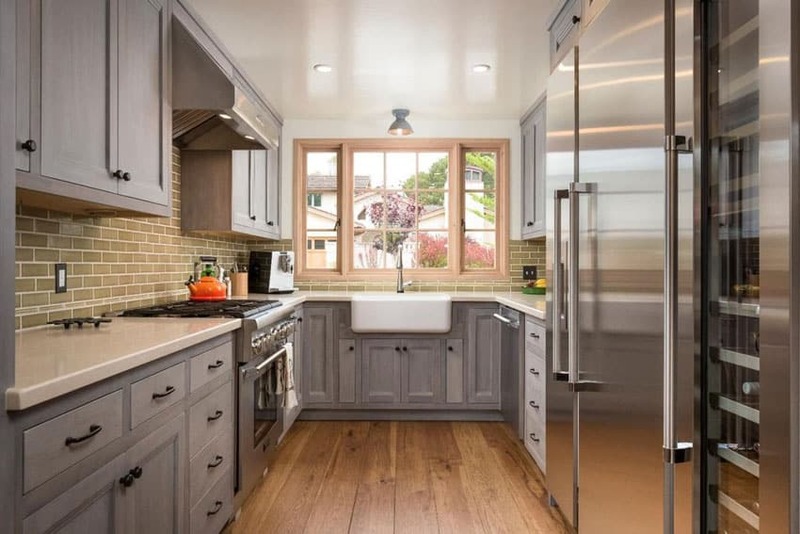 This small traditional galley style kitchen comes with basic white raised panel cabinets, chrome-finished hardware, grey walls and a hanging pendant lamp with Edison bulb over the stainless steel wash basin. 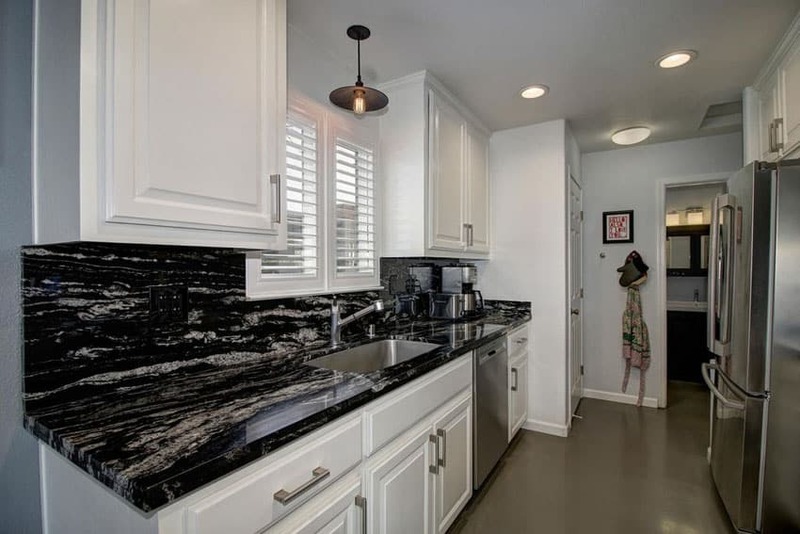 Modern flair is added by installing a space black granite countertop and backsplash with large, rough white grains running along its length, adding linearity to the galley.